Tom Davies believes clubs should be forced to run reserve-teams if they want a place in Super League. And he has hit out at the administration for failing scores of players over the last few years. Wigan and Wakefield were the only two top-flight clubs who ran reserve teams last season. New Super League chief executive Robert Elstone wants improvements next year, with Warrington, St Helens and Hull FC expected to get on board. But Davies doesn’t think that goes far enough. “Rugby league is one of the worst sports going with its organisation. I know it sounds bad but they couldn’t organise a booze-up in a brewery,” he said. “You get clubs over here, and no disrespect to them, but Salford just try and buy the players in and you can’t just keep doing it and expect the future talent to come through. “Without a doubt, they should be made to do it. “I bet a good 60 per cent of talent is going missing. I have friends who I played with at amateur who weren’t the best at 16, 17 myself included – and only developed late on. “There’s such a wide base of talent going missing because there’s nowhere to go. Currently, players too old for the U19s can only play on dual-registration for lower league clubs if they can’t play reserves. And Davies believes making reserves compulsory would open up a new talent stream. “Who’s ready for regular Super League at 19?” he said. “You go to St Pat’s first team, they have got some great players there who – when the reserves was going – may have got a shot somewhere. Now, they’ve nowhere to fit in the squads. Elstome wants to make the reserve competition mandatory. 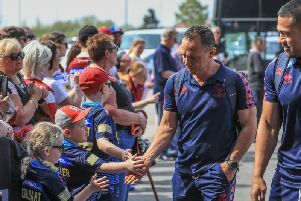 Even though he has been met with resistance from the RFL – who don’t think it should be compulsory – Elstone expects drastic improvements.